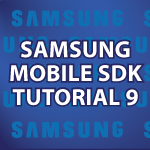 This is the final video in my Samsung Mobile SDK Tutorial. It has been a ton of fun exploring a new SDK literally days after it was introduced to the public. I did my best to also cover a bunch of general Android topics as well. Here I’ll specifically finish up the paint application we started back in part 7 of this series. We’ll create all of the event handlers we need to make sure our app runs like a professional tool. All of the code follows the video and it is heavily commented so it can be translated. Don’t forget to check out the Samsung Smart App Challenge which has extended the submission deadline from Nov 30th to Dec 31st! This challenge will judge and select the 12 winning apps that best incorporate the Pen package or Look package in Samsung Mobile SDK. as well as a host of marketing support for app promotion. hello admin u have problm while installing eclipse . eclipse failed to load the jni shared library jvm.dll it pop up this. (m using 64bit win8) pls hlp as quick as pssbl . You need to use a 64 bit version of Eclipse and Java to solve this problem. i have instald eclipse also android plugin for it wat if now i also install android studio will it misconfigure or harm anything?? and why u didnt use android studio ?? You can use Eclipse and Android Studio without conflicts. I don’t use Android Studio in these tutorials because the install fails on to many machines. derek thanks for all the awesome videos you make but can you also make videos on using the facebook android sdk and twitter api……. You’re very welcome 🙂 I’ll be taking a look at both Facebook and Twitter. I’m sure I can make a Twitter app, but I’m not sure about Facebook because it changes constantly. for begining with php do we have to install anything?? do you have tutorial on it .i am new to php. Yes you need to install a web server. I use Apache. If you’re on a Mac or Linux machine chances are it is already installed or it is very easy to install. If you are on Windows I’d install WUBI, which is like Linux installed as an application, or WAMP.